To Cite: de Sousa Fortes L, Pinheiro Paes P, Tavares Paes S, Oliveira Carvalho F, Serpeloni Cyrino E. Clustering vs Multi-Sets Method in Resistance Training: Effect on Heart Rate Variability, Asian J Sports Med. 2018 ; 9(1):e14576. doi: 10.5812/asjsm.14576. The aim of this study was to analyze the effect of two different methods (clustering and multi-sets) on resistance training on heart rate variability (HRV) in young adults. A total of 31 volunteers were randomly divided into three groups: clustering (GCL), multi-sets (GMS) and control group (CG). Group and time interaction was identified (F(3, 28) = 36.71, P < 0.01), with reduction in CG (P = 0.01) and increase in GCL (P = 0.01) and GMS (P = 0.01). It was concluded that both clustering and multi-sets enhanced HRV after 8 weeks of resistance training in trained young adult males. The cardiac muscle is innervated by sympathetic and parasympathetic fibers, which stimulate secretion of norepinephrine and acetylcholine, respectively (1). The sinoatrial nodule generates electrical signals, which depolarize and repolarize the synaptic membranes, which leads to rhythmicity of the heart (2), also known as heart rate variability (HRV) (3). The HRV in the time domain is evaluated by the R-R intervals, which represent the cardiac autonomic modulation (2). These intervals represent the time interval between depolarization of the sinoatrial node to the next depolarization (2). HRV is considered an important indicator of cardiovascular fitness and/or risk (1). The higher the HRV, the better adapted is the autonomic nervous system, which reproduces in the attenuation of cardiovascular risk (4). Studies have shown that HRV can be modulated by physical exercise (5-7). Chronic exposure to moderate to high physical exercise intensity leads to an increase in HRV in healthy subjects (1). However, the most findings related to the effects of physical exercise on HRV have adopted aerobic or combined exercise (aerobic + resistance training) as an intervention protocol. Therefore, few scientific investigations have analyzed the effect of resistance training alone on HRV. According to the American college of sports medicine (8), resistance training is a form of physical exercise that uses resistance generated by equipment, free weights, body mass and/or elastic bands against the movement of a given skeletal muscle. The main variables of resistance training prescription are: volume (sets x number of sets), intensity (percentage of maximum voluntary strength) and rest time between sets, exercises and training sessions (8). In addition to the prescription variables, according to Fisher et al. (9), the training methods adopted in resistance training programs are also important, considering the desired neurophysiological responses. The traditional method, also known as multi-sets, is the most commonly used in resistance training centers. It is the realization of multiple sets of the same exercise with an interval between each set (10), for example: 3 × 10 repetitions with 2 minutes of interval between sets. The clustering method, in turn, is like the multi-sets method, considering the realization of several sets of the same exercise, however, it has an interval between the repetitions of the exercise within the same set (11), for example: 3x (2 × 5 with 15 s of interval) with 2 minutes of interval between sets. Rio-Rodriguez et al. (12) showed that both methods of resistance training (clustering and multi-sets) reduced HRV in moderately trained individuals. Figueiredo et al. (13) also demonstrated attenuation of HRV after performing resistance training sessions adopting the multi-sets method. It is worth noting, however, that the respective investigations analyzed the acute effect of resistance training on HRV. It is considered important to investigate the chronic effects of different methods of resistance training in HRV. Therefore, it is questioned: what method (clustering vs multi-sets) leads to improvement of HRV? From a practical point of view, the present research may point out the effect of different resistance training methods on HRV, which is considered a good indicator of cardiovascular fitness fundamental to health (1). Therefore, the findings may be extremely important for professionals working in resistance training. Considering the notes, the objective of the research was to analyze the effect of two different methods (clustering and multi-sets) in resistance training on HRV in young adults. Therefore, some hypotheses have been formulated because of the considerations of Chen et al. (14): a) HRV increases in both resistance training protocols and; b) the HRV increases more in the clustering than multi-sets method. This is a controlled and randomized trial during an8-week period studying young male adults with previous experience in resistance training. The sample size analysis was conducted in the G*Power 3.1 software. Power of 0.85, α = 0.05 and effect size of 0.50 was adopted. Thus, the sample size of 27 subjects was revealed as necessary to conduct the experiment. This type of analysis was carried out with the premise of avoiding type II error and determining the minimum number of participants for the investigation. The participants were selected in a non-probabilistic way, totaling 36 male volunteers aged between 18 and 25 years. The selected sample size provided a statistical power > 92.5%. All subjects practiced resistance training for at least 6 months uninterrupted. The volunteers did not reveal a history of muscle or articular injury and did not use ergogenic substances to optimize strength, muscular volume or neuromuscular performance in the last 6 months. Participants were instructed not to change their daily routines, eating habits and not to join other physical exercise programs. After receiving information on the procedures to which they would be submitted, the participants signed a free and informed consent form. The participants were randomized using a random number table, stratified for HRV baseline (by a researcher not involved directly in the recruitment and data collection), in three groups: clustering (CL), multi-sets (MS) and control group (CG). It should be noted that the CG members were resistance training practitioners, however, they remained physically inactive during the 8 weeks of research. Each group consisted of 12 participants. However, 2 CL and 1 MS volunteers were excluded because of missing more than 5% of the resistance training sessions during the investigation (8 weeks). In addition, 2 participants were excluded from the CG due to adherence to a physical exercise program. Therefore, the research had a final sample of 31 volunteers (CL = 10, MS = 11 and CG = 10). It should be noted that, despite the sample loss, no statistical differences were identified for age (F(3, 28) = 1.54, P = 0.29), 1RM of lower limbs (F(3, 28) = 1.75, P = 0.21), 1RM of upper limbs (F(3, 28) = 2.17, P = 0.24) and HRV (F(3, 28) = 2.63, P = 0.20) between the groups prior to the initiation of the investigation. The procedures adopted in this study met the ethical standards of research in accordance with the Declaration of Helsinki, after approval by the research ethics committee of the Federal University of Pernambuco. Participants underwent 8 weeks of resistance training (3 weekly sessions with a 48-hour interval), except for CG members. 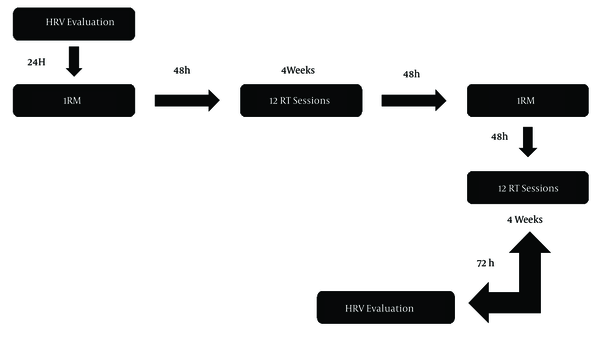 Eight weeks of intervention were adopted because researchers indicated how much duration of a physical training program required to cause significant change in HRV (2, 12). The CL performed the clustering method (11), while the MS performed the multi-sets method (10), as shown in Table 1. A maximal repetition test (1RM) was performed for the 45° leg press and bench press with the premise of prescribing the intensity of training based on the percentage of maximal strength (15). The 1RM tests were conducted every 4 weeks with the premise of adjusting the training intensity of participants. It is worth mentioning that the training load (volume and intensity) was identical for the two experimental groups (CL and MS). Abbreviations: CG, control group; CL, clustering group; MS, multi-sets group; RM, maximal repetition. The HRV was evaluated by the cardio frequency meter (Polar RS800CX, Polar Electro Oy, Joensuu, Finland) 72 h before (pre-experiment) and 72 h after (post-experiment) at 8 weeks of resistance training. The HRV measurement was conducted with a 72-h interval between the beginning and end of the intervention due to the participants' availability. In addition, it is worth mentioning that the autonomic nervous system response from physical exercise may remain for days after the last session (14, 16), which indicates the need for a 72-h interval for HRV assessment after the last session of the 8-week intervention. All procedures adopted in the experimental design are shown in Figure 1. It should be noted that the participants were instructed not to perform physical exercises in the 48 hours prior to HRV evaluation. Note. HRV = heart rate variability; RM = maximal repetition; RT = resistance training. The resistance training program was structured based on the current recommendations for the practice of resistance training in healthy adults (8), consisting of two exercises (bench press and 45o leg press), which were performed with a frequency of three weekly sessions (Sundays, Wednesdays and Fridays) for 8 consecutive weeks. The sessions were conducted at the same time of day to avoid circadian rhythm influence. All sessions were supervised by two experienced researchers in resistance training. Table 1 indicates the training program performed by each group (CL, MS and CG). Each resistance training session consisted of two exercises: bench press and 45° leg press. In all, 24 resistance training sessions were conducted for CL and MS. Warm-up (1 × 10-15 repetitions with 50% of 1RM predicted and 1 × 6-8 repetitions with 70% of 1RM predicted, taking 3 minutes of interval between sets) was conducted for each exercise (bench press and 45° leg press) before the completion each resistance training session. It should be emphasized that the CG did not perform resistance training during the investigation (8 weeks). Evaluations were performed under the same conditions. No physical training session was performed in the previous 48 hours. R-R intervals were obtained using a portable heart rate monitor (Polar® RS800cx, Kempele, Finland) with sampling at 1,000 Hz, continuously for 5 min. Data were visually inspected to identify ectopic beats (< 3%) (5), which were removed and replaced by interpolation of adjacent R-R ranges. The R-R values were transferred to the computer via the Polar Software (Polar® ProTrainer, Kempele, Finland) and exported for HRV time-domain analyzes using the Kubios v2 software (Polar® Kubios v2, Kuopio, Finland). The variable analyzed was the difference of the quadratic mean of the successive normal R-R intervals (RMSSD), which were converted into logarithmic transformation (InRMSSD) to avoid outliers and simplify the analyzes, as indicated by Nakamura et al. (5) and adopted by Panissa et al . (16). InRMSSD values are displayed in milliseconds (ms). Muscle strength was determined by the 1RM test. The exercises performed were the bench press and the 45° leg press on Righetto® brand machines. A protocol of familiarization with the 1RM test was used to reduce the effects of learning to motor gestures (17). All subjects were tested, in a situation like that of the adopted protocol, in two different sessions, interspersed with periods of 48 hours. For each exercise, up to three attempts were made for the 1RM test with a three- to five-minute interval between trials and exercises (18). The interclass correlation coefficient and the standard error of measurement between the familiarization sessions and the 1RM test were 0.99 and 3.6 kg for bench press and 0.99 and 5.2 kg for 45° leg press. It is noted that warm-up (1 × 10-15 repetitions with 50% of 1RM predicted and 1 × 6-8 repetitions with 70% of 1RM predicted, adopting 3 min of interval between sets) was performed for each exercise (bench press and 45° leg press) before performing the muscle strength test. It should be noted that verbal incentives were designed for the participants during the tests of evaluation of muscle strength. A portable balance (Tanita®) and a stadiometer (Welmy®) were used to determine body mass and height. Body mass index (BMI) was calculated from the following formula: BMI = body mass (kg)/height (m)². The body density was determined using the skinfold thickness technique, using a compass of the brand Lange© (USA), using the pectoral, abdominal and thigh skinfolds, adopting the protocol of Jackson and Pollock (19). The international society for advancement for kineanthropometry (20) standardized measurements of skinfolds were used. The body fat percentage (%BF) was determined by means of the Siri equation (21). The Shapiro Wilk test was conducted to evaluate the distribution of the data. The Levene test was used to test for homoscedasticity. Considering the non-parametric violation of the data, we used measures of central tendency (mean) and dispersion (standard deviation) to describe the variables of the investigation. The univariate analysis (ANCOVA) of repeated measurements was performed to compare the HRV (InRMSSD) as a function of time and group [(2 (pre vs post-experiment) x 3 (CL vs MS vs GC)]. The BMI and the %BF were statistically controlled (covariables), and the effect size, represented by the acronym “d”, was used to the following criteria adopted according to the Rhea (22) notes: d < 0.35 = trivial, 0.35 ≤ d > 0.8 = low, 0.8 ≤ d > 1.5 = moderate, and d ≥ 1.5 = large effect size. All data were processed in SPSS 21.0 software, adopting a significance level of 5%. Descriptive data on age, BMI, %BF, 1RM values (bench press and 45° leg press) and HRV can be visualized in Table 2. Abbreviations: BMI, body mass index; CL, clustering group; CG, control group; MS, multi-sets group; 1RM, one maximal repetition; %BF, body fat percentage. Table 3 presents the results of HRV comparisons between groups. Group vs time interaction was identified (F(3, 28) = 36.71, P = 0.01), with reduction only CG (P = 0.01; d = 0.6) and increase in CL (P = 0.01; d = 0.8) and MS (P = 0.01; d = 0.7). Abbreviations: CG, control group; CL, clustering group; MS, multi-sets group. aP < 0,05 difference between MS and CG. bP < 0.05 in relation the “Pre-experiment”. It is worth noting that the results showed no collinearity of BMI with HRV (F(3, 28) = 2.03, P = 0.28). Likewise, the findings did not indicate collinearity of the %BF with HRV (F(3, 28) = 1.68, P = 0.34). What method (clustering vs multi-sets) leads to improvement of HRV? The aim of the study was to analyze the effect of two different methods (clustering and multi-sets) in resistance training on HRV in young adults. The main results showed an increase in HRV in the experimental groups (CL and MS) and reduction in CG, corroborating one of the hypotheses. However, no HRV difference between CL and MS was found, refuting one of the hypotheses of the present investigation. It should be noted that, to the best of our knowledge, this is the first research that investigated the chronic effect of different methods of resistance training on HRV in trained subjects, which makes comparisons with the scientific literature difficult. Rio-Rodriguez et al. (12) analyzed the acute effect of two methods in resistance training (clustering and multi-sets) on HRV in moderately trained individuals and demonstrated that HRV reduced in both conditions, although the multi-sets method revealed significantly greater attenuation. In the same direction, Figueiredo et al. (13) reported a decrease in HRV after performing resistance training sessions (60, 70 and 80% of 1RM), adopting the multi-sets method. It is worth mentioning again that the respective studies evaluated the acute effect of resistance training on HRV. In addition, the exercise protocol of the Rio-Rodriguez et al. study (12) adopted isometric muscle contraction, whereas Figueiredo et al. exercise protocol’s (13) used maximal isotonic repetition (up to concentric failure). Therefore, the different experimental designs of the studies in relation to the experimental design of the present study may explain the differences of the results. The findings of the present investigation revealed that HRV increased in both experimental groups (CL and MS), demonstrating a low effect size. Although studies have indicated that resistance training performed with an intensity greater than 60% of 1RM causes autonomic nervous system disturbance, representing on the reduction of HRV (12, 13), the scientific literature pointed out that exposure to repeated stimuli (aerobic exercise), as long as there is balance between stress and recovery, can lead to an increase in HRV (3, 7). According to Peçanha et al. (1), the increase in HRV can be explained by the optimization of the activation of the parasympathetic band and reduction of the sympathetic tone, which is explained by the reduction in plasma concentration of norepinephrine. In summary, the increase in HRV leads to a lower overload of the cardiovascular system, which, in turn, leads to a reduction in mortality risk (1). Perhaps, resistance training, regardless of the method adopted (clustering or multi-sets), in high intensity (> 70% of 1RM) and medium term (8 weeks), reduce the concentrations of metabolites (ammonia and urea) and pro-inflammatory cytokines (TNF-alpha and interleukin 2), leading to increased HRV, which is controlled by higher brain centers (brainstem and cerebellum), from the signals sent by the baroreceptors and chemoreceptors present in the blood vessels (2). This mechanism may, in a way, explain the increase in HRV in both experimental groups (CL and MS) in the present study. On the other hand, the results of the present study indicated a reduction in HRV in the CG, corroborating the scientific literature for subjects who interrupted the routine of physical training (4). Physical detraining seems to reduce HRV, contributing to an increase in cardiovascular risk (1). It is also worth mentioning that the decrease in HRV is closely related to the attenuation of maximum muscle strength (16), considered an important physical capacity associated with health (8). Although the present study reveals interesting and unpublished findings, it is important to emphasize that it has limitations. The low sample size for the three groups is emphasized (n ≤ 11). In addition, the use of male-only subjects can be considered as another limitation. Finally, it is pointed out as a limitation that there is no follow-up after 8 weeks of investigation. In this sense, the results should be treated with caution. From a practical point of view, the results of this research are important for professionals working in resistance training centers. Considering the findings, the professional can prescribe a resistance training program with high intensity (~ 75% of 1RM), adopting the multi-sets or clustering method for male young adults, if the objective is to increase HRV. In summary, it was concluded that both clustering and multi-sets methods enhanced HRV after 8 weeks of resistance training in trained male young adults. Finally, it is recommended that other investigations with a similar experimental design to the present study be carried out with the aim of confirming the results. 1. Pecanha T, Bartels R, Brito LC, Paula-Ribeiro M, Oliveira RS, Goldberger JJ. Methods of assessment of the post-exercise cardiac autonomic recovery: A methodological review. Int J Cardiol. 2017;227:795-802. doi: 10.1016/j.ijcard.2016.10.057. [PubMed: 27836300]. 2. Ferreira MJ, Zanesco A. Heart rate variability as important approach for assessment autonomic modulation. Motriz, Rev Educ Fis. 2016;22(2):3-8. doi: 10.1590/s1980-65742016000200001. 3. Kovacs R, Baggish AL. Cardiovascular adaptation in athletes. Trends Cardiovasc Med. 2016;26(1):46-52. doi: 10.1016/j.tcm.2015.04.003. [PubMed: 25976477]. 4. Kiss O, Sydo N, Vargha P, Vago H, Czimbalmos C, Edes E, et al. Detailed heart rate variability analysis in athletes. Clin Auton Res. 2016;26(4):245-52. doi: 10.1007/s10286-016-0360-z. [PubMed: 27271053]. 5. Nakamura FY, Flatt AA, Pereira LA, Ramirez-Campillo R, Loturco I, Esco MR. Ultra-Short-Term Heart Rate Variability is Sensitive to Training Effects in Team Sports Players. J Sports Sci Med. 2015;14(3):602-5. [PubMed: 26336347]. 6. Dellal A, Casamichana D, Castellano J, Haddad M, Moalla W, Chamari K. Cardiac Parasympathetic Reactivation in Elite Soccer Players During Different Types of Traditional High-Intensity Training Exercise Modes and Specific Tests, Interests and Limits. Asian J Sports Med. 2015;6(4):25723. doi: 10.5812/asjsm.25723. [PubMed: 26715972]. 7. Vilamitjana JJ, Lentini NA, Perez MF, Verde PE. Heart rate variability as biomarker of training load in professional soccer players. Med Sci Sports Exerc. 2014;46(5):1-7. doi: 10.1249/01.mss.0000496026.80272.dd. 8. American College of Sports M. American College of Sports Medicine position stand. Progression models in resistance training for healthy adults. Med Sci Sports Exerc. 2009;41(3):687-708. doi: 10.1249/MSS.0b013e3181915670. [PubMed: 19204579]. 9. Fisher JP, Carlson L, Steele J, Smith D. The effects of pre-exhaustion, exercise order, and rest intervals in a full-body resistance training intervention. Appl Physiol Nutr Metab. 2014;39(11):1265-70. doi: 10.1139/apnm-2014-0162. [PubMed: 25092528]. 10. Ribeiro AS, Schoenfeld BJ, Pina FLC, Souza MF, Nascimento MA, Santos L, et al. Resistance training in older women, Comparison of single vs. multiple sets on muscle strength and body composition. Isokinet Exerc Sci. 2015;23(1):53-60. doi: 10.3233/ies-140564. 11. Oliver JM, Kreutzer A, Jenke S, Phillips MD, Mitchell JB, Jones MT. Acute response to cluster sets in trained and untrained men. Eur J Appl Physiol. 2015;115(11):2383-93. doi: 10.1007/s00421-015-3216-7. [PubMed: 26183257]. 12. Rio-Rodriguez D, Iglesias-Soler E, Fernandez Del Olmo M. Set Configuration in Resistance Exercise: Muscle Fatigue and Cardiovascular Effects. PLoS One. 2016;11(3):151163. doi: 10.1371/journal.pone.0151163. [PubMed: 26982500]. 13. Figueiredo T, Willardson JM, Miranda H, Bentes CM, Reis VM, Simao R. Influence of Load Intensity on Postexercise Hypotension and Heart Rate Variability after a Strength Training Session. J Strength Cond Res. 2015;29(10):2941-8. doi: 10.1519/JSC.0000000000000954. [PubMed: 25807024]. 14. Chen JL, Yeh DP, Lee JP, Chen CY, Huang CY, Lee SD, et al. Parasympathetic nervous activity mirrors recovery status in weightlifting performance after training. J Strength Cond Res. 2011;25(6):1546-52. doi: 10.1519/JSC.0b013e3181da7858. [PubMed: 21273908]. 15. Fonseca RM, Roschel H, Tricoli V, de Souza EO, Wilson JM, Laurentino GC, et al. Changes in exercises are more effective than in loading schemes to improve muscle strength. J Strength Cond Res. 2014;28(11):3085-92. doi: 10.1519/JSC.0000000000000539. [PubMed: 24832974]. 16. Panissa VLG, Cal Abad CC, Julio UF, Andreato LV, Franchini E. High intensity intermittent exercise and its effects on heart rate variability and subsequent strength performance. Front Physiol. 2016;7(1):81. doi: 10.3389/fphys.2016.00081. 17. Schoenfeld BJ, Contreras B, Vigotsky AD, Peterson M. Differential Effects of Heavy Versus Moderate Loads on Measures of Strength and Hypertrophy in Resistance-Trained Men. J Sports Sci Med. 2016;15(4):715-22. [PubMed: 27928218]. 18. Bianco A, Filingeri D, Paoli A, Palma A. One repetition maximum bench press performance: a new approach for its evaluation in inexperienced males and females: a pilot study. J Bodyw Mov Ther. 2015;19(2):362-9. doi: 10.1016/j.jbmt.2014.11.019. [PubMed: 25892393]. 19. Jackson AS, Pollock ML. Generalized equations for predicting body density of men. 1978. Br J Nutr. 2004;91(1):161-8. [PubMed: 14748950]. 20. The Internacional Society for Advancement for Kineanthropometry (ISAK). The internacional society for advancement for kineanthropometry. Australia: National Library of Australia; 2013. Available from: http://www.isakonline.com. 21. Siri WE. The gross composition of the body. In: Tobias CA, Lawrence JH, editors. Advances in biological and medical physics. New York: Academic Press; 1956. p. 239-80. doi: 10.1016/B978-1-4832-3110-5.50011-X. 22. Rhea MR. Determining the magnitude of treatment effects in strength training research through the use of the effect size. J Strength Cond Res. 2004;18(4):918-20. doi: 10.1519/14403.1. [PubMed: 15574101].